Find Better Ideas, Faster ® with a custom kids apparel trend report, our PRO Dashboard and 80+ categories of premium trend reports. 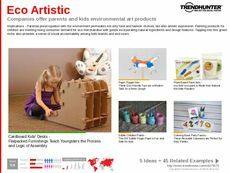 The Trend Hunter Kids Apparel Report has amalgamated the latest children's fashion trends allowing you to see just how lucrative this business opportunity could be. The pervasiveness of kids apparel has stretched from fashion runways across the world to the covers of magazines. Having realized this, brands and consumers alike can now turn to Trend Hunter to catch up on the newest and freshest kids apparel trends. As the kids fashion landscape and market continues to evolve, more and more brands continue to enter this extremely lucrative realm. Fashion brands and even current children clothing designers can use the Kids Apparel Trend Report to guide their future success in creating perfect petite outfits for kids. The Kids Apparel Trend Report is a highly useful tool for fashion brands looking to extend their product offerings to other demographics and anyone in the clothing industry hoping to gain a better understanding of this particular group of consumers.